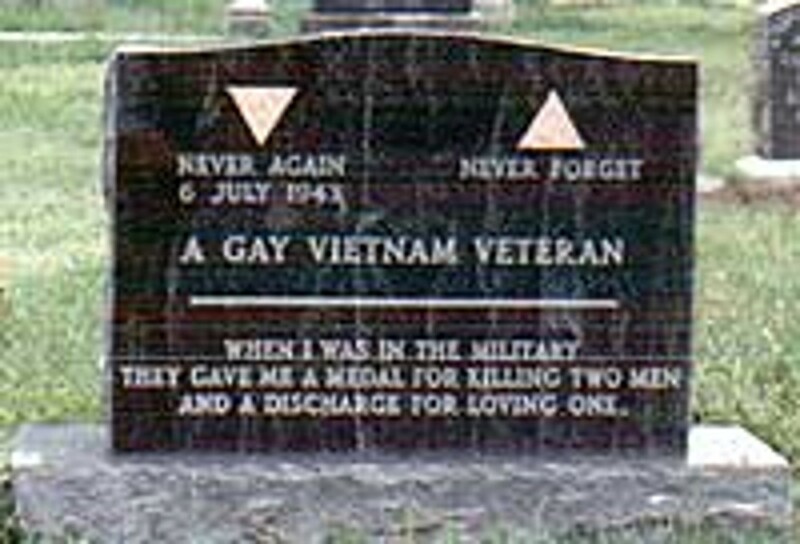 Air Force Sergeant Leonard Matlovich’s (1943-1988) tombstone reads “Never Again, Never Forget — A Gay Vietnam Veteran — When I was in the military they gave me a metal for killing two men and a discharge for loving one.” Matlovich, who did three tours of duty in Vietnam and earned a bronze star, was discharged from the Air Force in 1975 when he publicly declared his homosexuality. After three years of fighting the decision, Matlovich won his case and was given the opportunity to be reinstated in the USAF or settle. He chose to settle and donated some of his money to lesbian and gay organizations, including the San Francisco Gay Men’s Chorus. The rest he used to open a pizza parlor in Guerneville, the gay resort on the Russian River north of San Francisco, which he operated until illness made it impossible for him to work. In that same cemetery, on top of the hill, there is a progressive catholic church that holds weekly services. While those services are open to all, we reach out especally to the GLBT community. All the clergy are openly gay, as is much of the congregation. While Congress won’t allow GLBT people to legally marry, you certainly can get married in their cemetery! Veteran (army) here, and this story breaks my heart. Win the Bronze Star and get kicked out for loving the “wrong” person? Jeez. I didn’t realize love was such a bad thing. But Sgt. Matlovich still fought a battle, and won; a real soldier (well, a real “zoomie”, at least, if not a “grunt”…) who was unwilling to give up without a fight. The millitary should have known the guy wasn’t going to be a pushover! I LOVE that he managed to make a powerful statement on his headstone; it should last a couple hundred years. By the way, I forgot to compliment Paula on a cool and interesting web site, but especially this particular story. I alway say I’m interested in history, and this is something I SHOULD HAVE KNOWN, but at least NOW I do know about it. Oh, in case it’s important to anyone, straight (but not narrow!) guy here. Now that DADT has passed the Senate, the House and has been signed into law by President Obama, true recognition should be given to the legacy and wonderful motto of Leonard Matlovich, a true pioneer. The prescient saying he inscribed on his tombstone has been a rallying cry for 25 years now! His wish finally came true. SHAME on those EVIL Republicans who have fought against this Constitutionally guaranteed freedom for all these years. Now its onward to implement E.N.D.A., end DoMA and make Marriage Equality the law of the land! I should add Walt Whitman’s great love, Peter Doyle, is also buried in that cemetery. Given Whitman’s love of Pete and of Washington, he probably would’ve been buried there too if he hadn’t suffered a stroke and gone to be cared for by his brother’s family in Camden. It’s a pretty sweet cemetery. Thanks for that! I know about Peter Doyle, but didn’t know where he was buried.